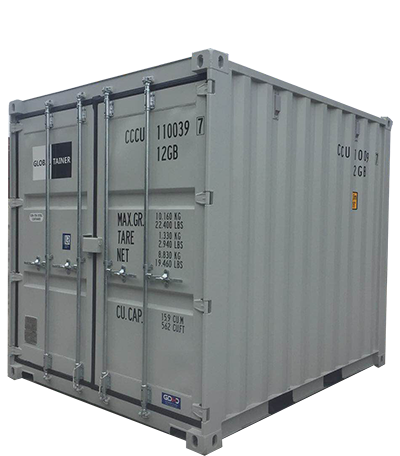 At ConRail UK, we feel strongly that you should be able to get the exact container you need, for a fair price. With this in mind, we are eagerly awaiting the arrival of our new delivery of standard containers, in variable smaller sizes, coming in to Felixstowe in late November. Standard containers, sometimes known as ‘general all purpose’ containers, are the most widely used container available. They are suited for the vast majority of cargo loads which don’t require the specialised benefits such as climate control, which we see in our other containers. Standard containers will typically have doors at one, or indeed both, ends. They are ideal, simple and straight-forward. They are closed containers, meaning that when the doors are shut, they are a sealed box. Typically these containers are only offered in 20ft and 40ft models leaving very little flexibility for the user. What’s exciting about our new delivery is that we have some smaller, more versatile standard containers arriving. All cargo containers have to meet certain criteria, which are dictated by the International Organization for Standardization (ISO). This means that it doesn’t matter where a container is built, it will conform to the basic requirements. Whilst this is with the primary intention of facilitating efficient and effective distribution at sea, it means that you as a consumer also know what you are getting. For shipping purposes, 20ft and 40ft standard containers are the most frequently used. It’s very rare to see much smaller containers. However, we all know that limiting containers to shipping use only is short-sighted. Containers have a variety of uses beyond shipping. They are ideal for worksites to store tools and machinery to prevent theft. They are useful as outdoor offices and exhibition spaces. They are used for domestic and corporate removal and storage needs. They can be used for site offices and catering facilities. Schools and clubs may use them for sports gear storage. Retailers use them for holding stock more cost-effectively, and close to site, than warehousing. There are a huge number of uses. Often in these cases, 20ft or 40ft containers are simply too large for the job. The ground space may not be available, transport is more difficult, and they can wallow predominantly empty. They are costly when you aren’t fully utilising the space. This is when smaller standard containers are needed. What can I expect from a standard container? Standard containers are all made from marine-grade steel. Inside you’ll find a floor constructed of 28mm marine-grade plywood, which is tough against both vermin and rot. This combination ensures your container is watertight, keeping whatever you store in it dry. Furthermore, this construction is robust and sturdy. They are secure and remain in excellent condition for a very long time. Furthermore, all of these containers are fitted with additional ventilation to ensure that condensation doesn’t become a problem, without compromising the waterproof nature of the container itself. All of these small containers are fitted with easy-to-use waist-level locking bars complete with a lock box for protecting the locking mechanism from forced entry. Forklift pockets come as standard on all of these containers. They allow forklifts easy-handling, further improving the versatility of these containers. We believe in providing the exact containers you need. That’s why we specialise in bringing you something a little different, whether that’s a climate controlled container, or these small size standard containers. We also offer complete flexibility. There is no such thing as a ‘standard’ order, even of a ‘standard’ container. We listen to your needs, advise which container will suit you best, and work with you to deliver it where you need it. We also offer both buying and leasing options, ensuring you can always make the most cost-effective choice. 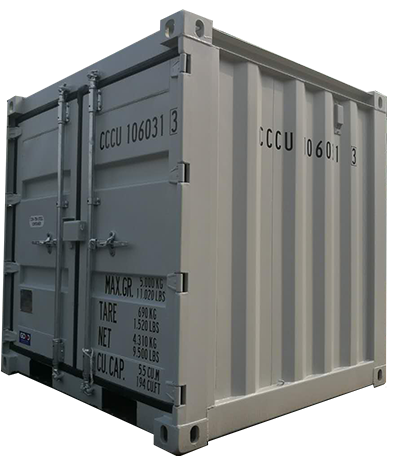 Furthermore, each of these smaller standard shipping containers are available at a highly competitive price. 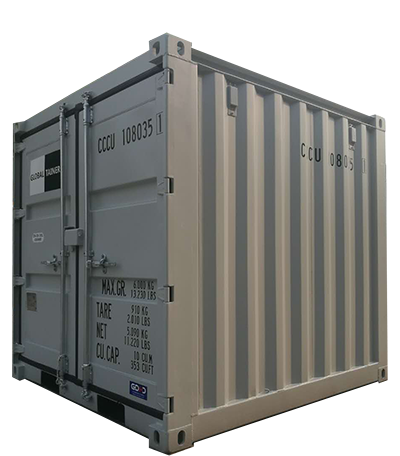 10’ containers are just £1690, 8’ just £1575 and 6’ just £1100. VAT and delivery costs are added at ordering. You really can choose the size you need and still know you are getting exceptional value for money. Find out more, and speak to an experienced adviser, by giving us a call on 01252 715 406.